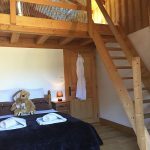 Split level room with a double bed in the main room and two single beds in the top level mezzanine room. There is a balcony that looks out the front of the chalet with spectacular elevated views down the valley. 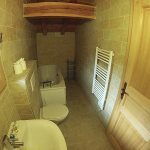 In addition there is a private bathroom with a bath and hand held shower. The top mezzanine room has restricted head with a very low ceiling especially around the edge of the room. Please see photos. Perfectly suited to a family of 2 adults and 2 children, however all adults are welcome. This room has lots of character with exposed beamwork in the apex of the chalet. It’s possible to ski back to the chalet and you can also clip in to your ski just one minutes walk from the chalet.